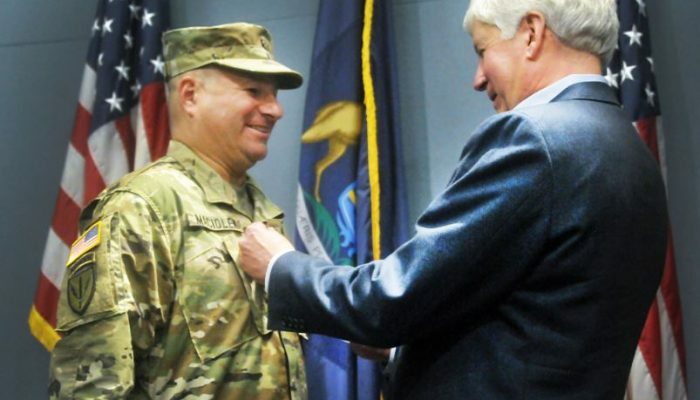 Governor Rick Snyder performed a promotion ceremony for Michigan National Guard soldier, Robert Maciolek, Monday Oct. 9, in the executive conference room of the George W. Romney Building, in Lansing. Maciolek was promoted to the rank of Lieutenant Colonel surrounded by family, friends, and coworkers. Maciolek enlisted with the 1st Battalion, 24th Marines in 1984 as a Basic Rifleman. He attained the rank of Sergeant in January 1990 and mobilized in support of Operation Desert Shield/Desert Storm in December of the same year. He also deployed to the Philippines as part of a special Marine Air Ground Task Force and discharged from the USMC in 1992 after completing his service agreement. Still wanting to serve his state and nation, Maciolek enlisted in 1999 with Company F, 425th Infantry Regiment, Michigan Army National Guard, as a 31-C Radio Operator. He graduated from Radio Operator School in 2000 and Basic Airborne School in 2001. Ever raising the performance bar, Maciolek was direct commissioned as a 2nd Lieutenant in 2003 with the Michigan Signal Corps – the first Signal Corps direct commission in the state of Michigan in 20 years. Maciolek is currently the OIC (Officer In Charge) of Cyber Defense Operations for the Michigan Army National Guard; he is the technical lead for all incident response and command operations. Using his education and experience with system automation and information assurance, he helps to protect and defend a vital section of the U.S. Department of Defense network, specifically portions that serve the Michigan Army National Guard. Maciolek’s civilian occupation as the President of Static Line Software, Inc., an information technology service and a veteran owned business, aids and prepares him for his OIC job with the Michigan Army National Guard. He is a current Certified Information Systems Security Professional (CISSP). In additional to his military and civilian duties, Maciolek is a previous member of Governor Snyder’s advisory committee on pain and symptom management. In that role, he was charged with addressing issues pertaining to pain and symptom management, and with holding public hearings to gather information and make recommendations to the Michigan Legislature on the subject. He now serves on the Michigan Board of Chiropractic representing the public. Maciolek’s self-described leadership philosophy is simple and direct. Say what you mean, mean what you say, and do what you say you are going to do. “Throughout my career, I have had the pleasure of serving with and for some outstanding officers and have been blessed to command and be mentored by some incredibly professional non-commissioned officers. I would not be where I am today without their help, influence, and dedication to duty,” said Maciolek. Maciolek currently resides in Macomb Township, Michigan with his wife Debbie, son Blake, and daughter Claire.